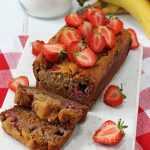 A delicious Strawberry Banana Bread recipe, made a little healthier with no refined sugar. The perfect afternoon snack for hungry kids! Grease a 2lb / 9 inch loaf tin with butter or oil. Line with parchment paper and then grease the paper. This ensures that the bread does not stick! Add the flour, baking powder and baking soda to a large bowl and mix with a spoon. In a second bowl add the mashed banana, coconut oil, honey, yogurt, egg and vanilla and mix well until combined. Add the wet ingredients into the bowl of dry ingredients and mix with a spoon. Finally, fold in the chopped strawberries. Transfer the mixture to the prepared loaf tin and bake in the oven for 20 minutes, then remove the tin from the oven, cover the bread loosely with foil, and return it to the oven. Turn the temperature down to 160C / 320F and bake for a further 35 minutes, or until a skewer inserted in the middle of the banana bread comes out clean. Once the loaf has cooked, remove it from the oven. Allow to cool in the tin for 5-10 minutes before transferring to a wire rack to cool completely.